This time of year, the heat and humidity of the summer season is, hopefully, becoming a welcomed memory and cool breezes and the beauty of the reds, golds, and oranges of fall begin to emerge. Don’t we all love it when the seasons change? But what about our lives? 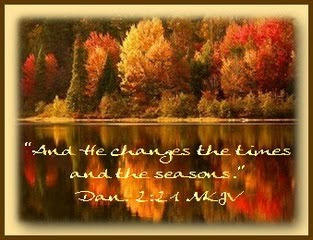 Do we accept the seasons of spiritual change prompted by the circumstances in our lives? Do we see any beauty emerge from the myriad trials and afflictions that assault us? If “There is a time for everything, and a season for every activity under heaven” (Eccl. 3:1 NIV), how do we view the changes? Where can the most beautiful vistas be viewed? From atop the summit of the tallest mountain, after the most strenuous climb. Which valleys have the richest, green velvet pastures with the fullest spikes of wildflower colors? Those that have withstood the greatest drenching rains. What forests produce the most prolific new growth? Those that have suffered the hot, searing flames of destruction. Which diamonds sparkle the most brilliantly? Those that have felt the cleaving of the jeweler’s sharp chisel and the friction of the polishing wheel. Just as all of nature suffers contrary conditions in order to be expanded, improved, or strengthened, so, too, do we. Difficulties and trials will always be a part of our lives. We cannot separate ourselves from them. And if we ponder it closely, we realize we will not grow as Christians if trials do not come to test and enlarge us that our greater beauty might emerge. If we try to wiggle out of these times, we force premature deliverance, frustrating God’s plan. It is like prying open a cocoon before the caterpillar has finished its metamorphosis into a butterfly. Forcing open the cocoon too soon will render the caterpillar deformed for the rest of its short lifespan. When we manipulate the hands of the clock to align with our own agenda, we destroy the beauty that God desires to emerge from His timing. Through our own efforts to “help” God out with our deliverance, do we come out of our cocoon of circumstance too early and spiritually deformed in some way? Or do we wait for the revealed transformation by God’s hand? God will work out all our circumstances for our benefit, from one spiritual season to the next, when we fully commit them and ourselves to Him, His Word, and His timing. Have you ever cried out to God like David did? A relentless condition that displays itself spiritually may besiege us and sometimes be healed more quickly than one that is physical in nature. We realize that, in time, God always heals our spirits, if we allow Him. However, we all wonder why God physically heals some people and, seemingly, not others. This question of life does not automatically receive an adequate answer for God does not always pull back heaven’s curtain to permit us a peek backstage into the scripted plot of His plan of action. Recently, I read a passage of scripture that had previously escaped my notice and, in a strange way, has helped me in wrestling with this question. 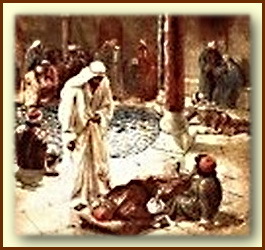 Concealed in a story in John 5, it relates the healing of the lame man at the pool of Bethesda. A gathering of people, amassed around the fringe of Bethesda’s pool. The blind stood with the deaf. The withered sat with the weak and feeble. The diseased leaned against the porch pillars. The crippled laid on mats. All anticipated the disturbance of the waters of healing, waiting to be the first to jump in like a flock of seagulls, hovering over a fishing dock, ready to swoop down for the catch of the day. With a voice of power that could easily stir the waters on its own, Jesus said, “Stand up! Pick up your mat and start walking!” As the man jumped up, the prickly sensation of healing surged through his limbs. Nothing is said of any other healings that day. I wonder why not. Did those there just stare at Jesus in bewilderment? Did they focus only on the water, awaiting their turn? Did they desire not to be healed? Were they afraid? Maybe God desired no further healings because they would have endangered Jesus’ life even more, for the Jews sought to kill Him for healing just this one man on the Sabbath. What might they have done if He had healed everyone? For whatever reason, it was God’s purpose not to heal any others at that moment. In my relentless physical condition, I no longer feel adrift on a sea of doubt, wondering why I am not healed. Whether I am or not, I remain part of God’s purpose and praise Him for it. He has whispered to my spirit that He will heal me and I trust Him to keep His promise. I hold His hand as a child holds its father’s hand in trust to cross a dangerous intersection. I know that healing is still in my future, whether it comes while I am here on earth or in heaven. For various reasons, some are healed and some are not. God knows them all. Jesus said, “I am the Vine; you are the branches…However, apart from Me [cut off from vital union with Me] you can do nothing” (John 15:5 AMP). If you couldn’t find him, you looked in the garden. If he wasn’t there digging in the dirt, then my father was in his greenhouse sticking lifeless limbs and plants into his special soil mixture. In its own time, each plant came back to life in my father’s greenhouse. Paul said, “Let your roots grow down into Him and draw up nourishment from Him,” (Colossians 2:7a TLB). When we allow the sucker branches of circumstances to sap our strength, the weeds of worries to weaken our faith roots, and the vermin of busy schedules to eat away at our relationship with the Lord, how much nourishment do our spiritual roots draw up? One who does not keep his roots firmly planted in the special soil of God’s Presence and His Word will remain a Lifeless branch, separated from the Vine. Only when each soul-branch is “nourished in the words of faith and of the good doctrine” (1 Tim. 4:6 NKJV) will it come back to Life in the Father’s house. Then, “Those who are planted in the house of the LORD shall flourish in the courts of our God.” (Ps. 92:13 NKJV). PRAYER: Father, as our roots of faith grow deep within Your Son, “like a tree planted by the waters, which spreads out its roots,” (Jer. 17:8a NKJV), we draw up the spiritual nourishment necessary to bring eternal life into all we say and do. Help us to stay firmly planted in Your truths, that our roots may be holy. Amen.